In the past several years, grid computing has emerged as a way to harness and take advantage of computing resources across geographies and organizations. 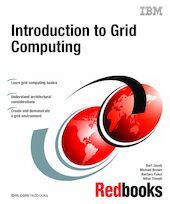 In this IBM Redbooks publication, we describe a generalized view of grid computing including concepts, standards, and ways in which grid computing can provide business value to your organization. In a nutshell, grid computing is all about virtualization that enables businesses to take advantage of a variety of IT resources in order to be more responsive to demands of the business and increase availability of applications while reducing both infrastructure and management costs. There are many products and toolkits available from IBM and other companies that enable different aspects of grid computing. One of the most well known toolkits is the Globus Toolkit. Globus Toolkit 4 provides components and services conforming to existing and evolving standards that can be used as the basis for a grid computing solution. In the second half of this book we provide instructions for installing and configuring a simple Globus environment that can be used to demonstrate various aspects of grid computing and to build a proof of concept environment. We also describe, and provide as additional material, a sample grid application that can be used to demonstrate, test, and teach more about the grid computing concepts introduced in this book.